Our idea of education is to provide children with those experiences and opportunities to journey on the path of wanting to know about themselves and the world around them, with a sense of respect and a positive self-esteem. At Full Circle Farm Preschool, each child is seen for who he or she truly is; a unique and special individual. Children have the opportunity to explore and experiment at their own level of knowledge and interest. Within this framework, the curriculum allows each child to master new skills in the areas of social, emotional, cognitive and physical development. 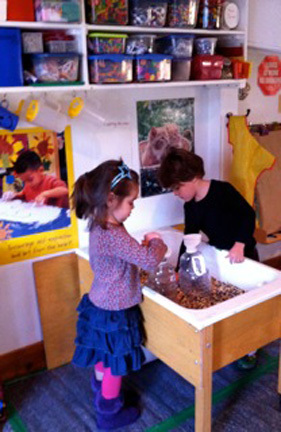 We believe that learning is best accomplished through play, observation and discovery. Our classroom offers a variety of learning centers. These centers include a block corner, an art area, sensory tables, writing center, book corner, play dough table, manipulative area, painting easel, math and science areas and a dramatic play area. Outdoor play is an essential part of our daily curriculum.We have a wonderful playground the children enjoy throughout the school year. We encourage a strong working relationship between parents and teachers. We view parents as team players and recognize their role to be crucial in their child’s success. Parents are always welcome to visit!